GER presents with regurgitation and occasional vomiting only without effects on growth and development whereas GERD usually has additional presentations. The objective of this review is to provide update on recent developments in the diagnosis and management of this condition. الإرتجاع المعدي المريئي هو صعود محتويات المعدة إلى المرئ, وهذه ظاهرة فسيولوجية عالمية وشائعة بين الأطفال. يجب التفريق بين الإرتجاع الفسيولوجي والمرضي والذي يعتمد على حدة الإرتجاع. يسبب هذه الظاهرة استرخاء العضلة العاصرة أسفل المرئ وبصورة أقل إنخفاض الضغط فيها. أعراض هذه الظاهرة الإرتجاع والقئ دون تأثير على نمو وتطور الطفل وربما تكون هناك أعراض أخرى. يهدف هذا العرض إلى تزويد القارئ بآخر المستجدات في تشخيص وعلاج هذه الحالة. Recurrent hoarsness, stridor, cough, wheezing, recurrent pneumonia otitis media, sinusitis, and dental erosion have been associated with GERD. However, the causal relation with GERD is frequently difficult to establish. Similarly, dystonic neck posturing (Sandifer syndrome) has been associated with GERD. In the majority of infants gastroesophageal reflux resolves spontaneously by 18 months of age. However, reflux esophagitis and its complications may occur indicating the need for regular follow up. This simple clinical assessment should be sufficient for the preliminary diagnosis of uncomplicated physiologic reflux in otherwise normal infants and further investigation is generally not needed. Also called pH probe or pH-Metry. The placement of a pH probe in the lower esophagus allows detection of refuxed acid. Although appears to be a simple test, it requires a strict technique to insure correct location of the probe which should be well above the LES to avoid the area of physiologic reflux. Clearly a probe placed too low will produce false positive results and too high will yield false negative results. More recently, to minimize discomfort, an alternative to the nasoesophageal route, a wireless capsule (the Bravo capsule) is attached to the esophagus. Whether by probe or wireless capsule, the measurement of pH is transmitted to a recorder which is disconnected from the patient after about 24 hours of recording. 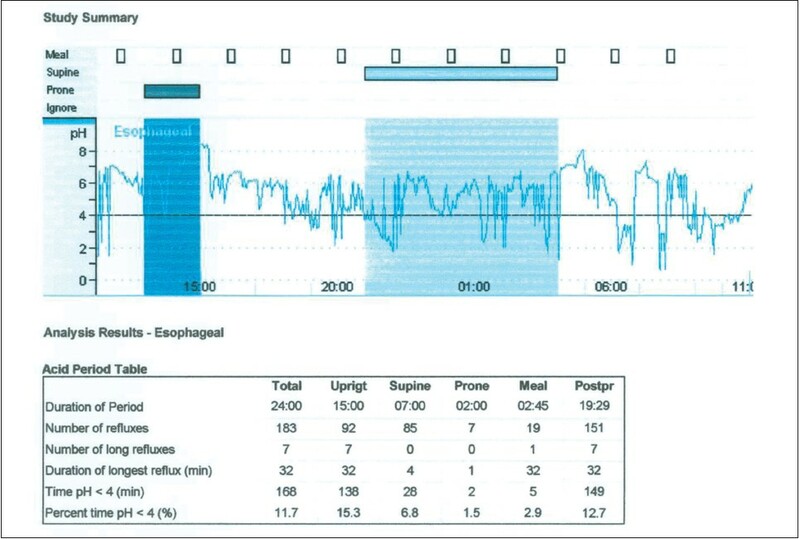 The data are downloaded into a computer program which produces a curve indicating the pH in the lower esophagus from the start to the end of the recording and quantitative analysis [Figure 1]. The interpretation of the data requires expertise as artifacts and technical problems may lead to distorted quantitative analysis and assessment of the quality of the recording should be performed before interpretation of the results. Quantitative parameters calculated over the study period (usually 24 hours) include the total number of reflux episodes, number of prolonged episodes, duration of the longest reflux episode, and percentage of time pH was less than 4. The latter is called the reflux index. Advantages of the pH studies include the ability to quantify reflux allowing the distinction between physiologic (GER) and pathologic reflux (GERD). In fact, this is the only test that quantifies reflux over a prolonged period of time. Another important advantage is to define the relation between reflux episodes and symptoms occurring during the recording by calculating the symptom index score (the number of symptoms occurring during or right after reflux episodes). A causal relationship is suggested when the symptom index score is more than 50%. However, the main drawback of this test is that esophageal pH studies do not detect non-acid reflux which commonly occurs in the postprandial period and may be the cause of chronic respiratory disease. Visualization of the esophageal mucosa detects signs of inflammation which is confirmed by histopathology. Thus, this procedure is important for the detection of peptic esophagitis, a complication of GERD and not a diagnostic test of GERD per se. The degree and extent of esophageal lesions (erythema, erosions, and ulcerations) have been used in the grading of esophagitis. Endoscopy and biopsy also detect strictures and BE. Endoscopy and biopsy also help in the differential diagnosis of esophagitis which in addition to reflux esophagitis includes eosinophilic esophagitis, Crohn disease, infectious esophagitis, and webs. Because of poor correlation between endoscopic appearance and histology, biopsy is commonly recommended whenever endoscopy is performed. This technique is performed by oral ingestion or instillation of technetium-labeled formula (milk scan) or food into the stomach. The gastroesophageal region and lungs are scanned by a gamma camera for evidence of reflux and aspiration for at least 30 minutes. Main advantages are the ability to demonstrate reflux of non-acidic gastric contents and study of gastric emptying, which may be delayed in children with GERD. Disadvantages include lack of standardization, high cost in terms of equipments and expertise. Ultrasonography: Monitoring of the gastroesophageal region after a meal for reflux has been introduced as a non-invasive technique for the identification of reflux. However, the test requires dedication and expertise which are not commonly available. Therefore, although attractive this test is not widely performed. Esophageal manometry is not a diagnostic test for reflux per se. It is frequently performed in adults to detect motility disorders associated with GERD, but rarely indicated in children. The bilitech 2000: A fiberoptic spectrophotometric probe detects bilirubin in the refluxate may be helpful in the diagnosis of nonacid reflux caused by duodenogastric reflux disease. Lifestyle changes include feeding and positioning in infants and other measures in older children. Parental education and support are usually sufficient to manage healthy, thriving infants caused by physiologic GER. Breast-fed and formula-fed infants have a similar frequency of physiologic GER. Some infants with allergy to cow's milk protein experience regurgitation and vomiting indistinguishable from that associated with physiologic GER. Elimination of cow's milk protein from the diet and replacement with hydrolyzed or amino acid formula for about 2 weeks improve the vomiting and reintroduction causes recurrence of symptoms. , Cow's milk protein and other proteins pass into human breast milk in small quantities. Breast-fed infants with regurgitation and vomiting may therefore benefit from a trial of withdrawal of cow's milk and eggs from the maternal diet. , However, discontinuation of breast feeding is generally not needed or recommended. Although there are no data evaluating the role of soy-bean formula in the treatment of infants with regurgitation and cow's milk protein allergy (CMPA), these formulae may be an alternative in countries where the hydrolyzed formulae are not available. Manipulation of volume and density of feeding: Large volume feedings may promote regurgitation, probably by increasing the frequency of TLESR and reduced feeding volume may lead to decreased reflux frequency. Infants with failure to thrive may benefit from increasing the caloric density of formula when volume or frequency of feedings is decreased as a part of therapy. Thickening of feedings: Rice cereal - thickened formulae produce a decrease in the volume of regurgitation but may increase coughing during feedings. Excessive energy intake however is a potential problem with long-term use of feedings thickened with rice cereal or cornstarch. For example, thickening a 20-kcal/oz infant formula with 1 tablespoon of rice cereal per ounce increases the energy density to 34 kcal/oz (1.1 kcal/ml). Commercial anti-regurgitant (AR) formulae containing processed rice, corn or potato starch, decrease overt regurgitation and vomiting frequency and volume. When ingested in normal volumes, AR formulae contain an energy density, osmolarity, protein, calcium, and fatty acid content appropriate to an infant's nutritional needs, whereas a formula with added thickener has a higher energy density. Several studies in infants have demonstrated significantly decreased acid reflux in the flat prone position compared with flat supine position. ,,,, The semisupine positioning as attained in an infant car seat exacerbates GER. Based on these studies, the prone position was the recommended positioning after feeds. However, reports on the association between prone positioning and sudden infant death syndrome (SIDS) led to modification of this recommendation that the prone position is no longer recommended routinely. However, in certain special situations prone positioning may be considered, such as infants with certain upper airway disorders in which the risk of death from GERD may outweigh the risk of SIDS or children older than 1 year of age with GER or GERD whose risk of SIDS is negligible. Lifestyle changes often recommended for children and adolescents with GER and GERD include dietary modification, weight loss in overweight patients, positioning changes, and avoidance of smoking. However, it is not known whether any lifestyle changes have an additive benefit in children or adolescents receiving adequate pharmacological therapy. They directly buffer gastric contents, thereby reducing heartburn and healing esophagitis. On-demand use of antacids may provide rapid symptom relief in some children and adolescents with GERD. However, prolonged treatment with aluminum-containing antacids significantly increases plasma aluminum in infants, , and some studies report plasma aluminum concentrations close to those that have been associated with osteopenia, rickets, microcytic anemia, and neurotoxicity. , Because safe and convenient alternatives are available, chronic antacid therapy is generally not recommended for children with GERD. Most of these agents contain either alginate or sucralfate. Efficacy of alginate is controversial. Sucralfate is a compound of sucrose, sulfate, and aluminum, which, in an acid environment, forms a gel that binds to the exposed mucosa of peptic erosions. In adults, sucralfate decreased symptoms and promoted healing of nonerosive esophagitis. The available data are inadequate to determine the safety or efficacy of sucralfate in the treatment of GERD in infants and children, particularly the risk of aluminum toxicity with long-term use. None of the surface agents is recommended as a sole treatment for severe symptoms or erosive esophagitis. They inhibit acid secretion by blocking Na + -K + -ATPase, the final common pathway of parietal cell acid secretion (the proton pump). The superiority of PPIs is related to their ability to maintain intragastric pH at or above 4 for longer periods and to inhibit meal-induced acid secretion, a characteristic not shared by H2RAs. In addition, the effect of PPIs does not diminish with chronic use. The potent suppression of acid secretion by PPIs also results in decrease of 24-hour intragastric volumes, thereby facilitating gastric emptying and decreasing gastric volume and reflux. In children, as in adults, PPIs are highly efficacious for the treatment of symptoms due to GERD and the healing of erosive disease. PPIs have greater efficacy than H2RAs and children below 10 years of age appear to require a higher dose per kilogram for some PPIs than adolescents and adults. However, double-blind randomized placebo-controlled trials (RCTs) show that PPI therapy is not beneficial for the treatment of infants with symptoms that previously were purported but not proven to be due to GERD although in one study, esomeprazole reduced esophageal acid exposure and the number of acidic reflux events. ,, Poorly controlled asthma is an example of lack of benefit and even increased risk of PPIs. In a recent RCT, children with poorly controlled asthma without symptoms of GER who were using inhaled corticosteroids, the addition of lansoprazole, compared with placebo, improved neither symptoms nor lung function but was associated with increased adverse events. There are potential side effects related to PPIs: Idiosyncratic reactions, drug-drug interactions, drug-induced hypergastrinemia, and drug-induced hypochlorhydria. Complications following antireflux surgery may be due to alterations in fundic capacity, altered gastric compliance, and sensory responses that may persist from months to years. These include gas-bloat syndrome, early satiety, dumping syndrome, and postoperative retching and gagging. In a postoperative study of children with no underlying disorders, 36% had mild to moderate gas bloat symptoms, 32% were ''very slow'' to finish most meals, 28% were unable to burp or vomit, and 25% choked on some solids. Early and late operative failure may result from disruption of the wrap or slippage of the wrap into the chest. In otherwise healthy children evaluated at a mean of 10 months (1-35 months) following antireflux surgery, 67% had ''no complaints,'' but one third had objective evidence of operative failure. Operative complications include splenic or esophageal laceration, each of which occurs in about 0.2% of pediatric cases. Laparoscopic Nissen fundoplication has largely replaced open Nissen fundoplication as the preferred antireflux surgery for adults and children, due to its decreased morbidity, shorter hospital stays, and fewer perioperative problems. Antireflux surgery may be of benefit in children with confirmed GERD who have failed optimal medical therapy, or who are dependent on medical therapy over a long period of time, or who are significantly non-adherent with medical therapy, or who have life-threatening complications of GERD. Infants with uncomplicated recurrent regurgitation and vomiting: This is the typical presentation of physiologic GER. The history and physical examination are usually sufficient for the diagnosis. No other investigation is needed at this point. Parental education, reassurance, and follow up are recommended. In formula-fed infants, thickened or AR formula reduce the frequency of overt regurgitation and vomiting and may be prescribed. Infants with recurrent vomiting and poor weight gain: These patients present with symptoms suggestive of GERD rather than physiologic GER. Therefore, in addition to complete history and physical examination, the initial evaluation should include nutritional history, urinalysis, complete blood count, serum electrolytes, blood urea nitrogen, and serum creatinine. Other investigations should be based on suggestive historical details or results of screening tests. Management may include a discontinuation of cow's milk and a 2-week trial of extensively hydrolyzed formula or amino acid-based formula to exclude the possibility cow's milk allergy. Increased caloric density of formula and/or thickened formula, and education as to appropriate daily formula volume may be required to achieve normal growth. Careful follow-up of interval weight change and caloric intake is essential. If management fails to improve symptoms and weight gain, referral to a pediatric gastroenterologist is recommended for further investigations. Infants with unexplained crying and/or distressed behavior: Reflux is not a common cause of unexplained crying, irritability, or distressed behavior in otherwise healthy infants. Other causes include cow's milk protein allergy, neurologic disorders, constipation, and infection (especially of the urinary tract). Following exclusion of other causes, an empiric trial of extensively hydrolyzed protein formula or amino acid-based formula is reasonable in selected cases although evidence from the literature in support of such a trial is limited. There is no evidence to support the empiric use of acid suppression for the treatment of irritable infants. If irritability persists with no explanation other than suspected GERD, referral to pediatric gastroenterologist for further investigation is recommended. The child older than 18 months of age with chronic regurgitation or vomiting: Although these symptoms are not unique to GERD, evaluation to diagnose possible GERD and to rule out alternative diagnoses is recommended based on expert opinion. Testing may include upper gastrointestinal (GI) endoscopy and/or esophageal pH/MII, and/or barium upper GI series. Heartburn: Adolescents with typical symptoms of chronic heartburn should be treated with lifestyle changes if applicable (diet changes, weight loss, smoking avoidance, sleeping position, no late night eating) and a 2- to 4-week trial of PPI. If symptoms resolve, PPIs may be continued for up to 3 months. Heartburn that persists on PPI therapy or recurs after this therapy is stopped should be investigated further by a pediatric gastroenterologist. Reflux esophagitis: In pediatric patients with endoscopically diagnosed reflux esophagitis or established non-erosive reflux disease, PPIs for 3 months constitute initial therapy. Not all reflux esophagitis are chronic or relapsing, and therefore trials of tapering the dose and then withdrawal of PPI therapy should be performed at intervals. In most cases of chronic-relapsing esophagitis, symptom relief can be used as a measure of efficacy of therapy, but in some circumstances repeat endoscopy or diagnostic studies may be indicated. Recurrence of symptoms and/or esophagitis after repeated trials of PPI withdrawal usually indicate that chronic-relapsing GERD is present, if other causes of esophagitis have been ruled out. At that point, therapeutic options include long-term PPI therapy or antireflux surgery. Barrett's esophagus (BE): Occurs in children with less frequency than it does in adults. Multiple biopsies documented in relation to endoscopically identified esophagogastric landmarks are advised to confirm or rule out the diagnosis of BE and dysplasia. In BE, aggressive acid suppression is advised by most experts. Symptoms are a poor guide to the severity of acid reflux and esophagitis in BE, and pH studies are often indicated to guide treatment. BE per se is not an indication for surgery. Dysplasia is managed according to adult guidelines. Dysphagia, odynophagia, and food refusal: Dysphagia, or difficulty in swallowing, occurs in association with oral and esophageal anatomic abnormalities, neurologic and motor disorders, oral and esophageal inflammatory diseases, and psychological stressors or disorders. Of the mucosal disorders, eosinophilic esophagitis is increasingly recognized as a common cause of dysphagia or odynophagia. Odynophagia, or painful swallowing, must be distinguished from heartburn (substernal pain caused by esophageal acid exposure) and dysphagia. Although odynophagia may be a symptom of peptic esophagitis, it is more often associated with other conditions such as oropharyngeal inflammation, esophageal ulcer, eosinophilic esophagitis, infectious esophagitis, and esophageal motor disorders. Although GERD is not a prevalent cause of dysphagia or odynophagia, an evaluation including barium upper GI series and possibly upper endoscopy should be considered if physical examination and history of disease do not reveal a cause. Therapy with acid suppression without evaluation is not recommended. In the infant with feeding refusal, acid suppression without diagnostic evaluation is not recommended. Infants with apnea or apparent life-threatening events (ALTEs): In the majority of infants with apnea or ALTEs, GER is not the cause. In the uncommon circumstance in which a relation between symptoms and GER is suspected or in those with recurrent symptoms, MII/pH esophageal monitoring in combination with polysomnographic recording and precise synchronous symptom recording may aid in establishing cause and effect. Reactive airways disease: In patients with asthma who also have heartburn, reflux may be a contributing factor to the asthma. Despite a high frequency of abnormal reflux studies in patients with asthma who do not have heartburn, there is no strong evidence to support empiric PPI therapy in unselected pediatric patients with wheezing or asthma. Three groups of asthmatics may benefit from PPI or surgical therapy. These include patients with heartburn, those with nocturnal asthma symptoms, and those with steroid-dependent difficult-to-control asthma. Finding abnormal esophageal pH exposure by esophageal pH monitoring, with or without impedance, before considering a trial of long-term PPI therapy or surgery may be useful although the predictive value of these studies for this purpose has not been established. Recurrent pneumonia and interstitial lung disease: These conditions of GERD due to aspiration of gastric contents. No test can determine whether reflux is causing recurrent pneumonia. An abnormal esophageal pH test may increase the probability, but is not a proof, that it is the cause of recurrent pneumonia. Nuclear scintigraphy can detect aspirated gastric contents when images are obtained for 24 hours after enteral administration of a labeled meal. Aspiration during swallowing is more common than aspiration of refluxed material. A trial of nasogastric feeding may be used to exclude aspiration during swallowing as a potential cause of recurrent disease. A trial of nasojejunal therapy may help in determining whether surgical antireflux therapy is likely to be beneficial. In patients with severely-impaired lung function, antireflux surgery may be necessary to prevent further pulmonary damage, despite lack of definitive proof that GER is causative. Upper airway symptoms: The data linking reflux to chronic hoarseness, chronic cough, sinusitis, chronic otitis media, erythema, and cobblestone appearance of the larynx come mainly from case reports and case series. The association of reflux with these conditions and response to antisecretory therapy have not been proven by controlled studies. Patients with these symptoms or signs should not be assumed to have GERD without consideration of other potential etiologies. Dental erosions: An association between GERD and dental erosions has been established. The severity of dental erosions seems to be correlated with the presence of GERD symptoms and, in adults, with the severity of proximal esophageal or oral exposure to an acidic pH. Young children and children with neurologic impairment appear to be at the greatest risk. Factors other than reflux that cause similar dental erosions include juice drinking, bulimia, and racial and genetic factors affecting the characteristics of enamel and saliva. Dystonic head posturing (Sandifer Syndrome): Sandifer syndrome (spasmodic torsional dystonia with arching of the back and opisthotonic posturing, mainly involving the neck and back) is an uncommon but specific manifestation of GERD. It resolves with antireflux treatment. 1. El Mouzan MI. Gastroesophageal reflux in infants and children. Ann Saudi Med 1991;11:152-8. 2. Vandenplas Y, Rudolph CD, Di Lorenzo C, Hassall E, Liptak G, Mazur L, et al. Pediatric gastroesophageal reflux clinical practice guideline: Joint Recommendations of the North American Society for Pediatric Gastroenterology, Hepatology, and Nutrition (NASPGHAN) and the European Society for Pediatric Gastroenterology, Hepatology, and Nutrition (ESPGHAN). J Pediatr Gastroenterol Nutr 2009;49:498-547. 3. Werlin SL, Dodds WJ, Hogan WJ, Arndorfer RC. Mechanisms of gastroesophageal reflux in children. J Pediatr 1980;97:244-9. 4. Iacono G, Merolla R, D'Amico D, Bonci E, Cavataio F, Di Prima L, et al. Gastrointestinal symptoms in infancy: A population-based prospective study. Dig Liver Dis 2005;37:432-8. 5. Nelson SP, Chen EH, Syniar GM, Christoffel KK. Prevalence of symptoms of gastroesophageal reflux during childhood: A pediatric practice-based survey. Pediatric Practice Research Group. Arch Pediatr Adolesc Med 2000;154:150-4. 6. Gupta SK, Hassall E, Chiu YL, Amer F, Heyman MB. Presenting symptoms of non-erosive and erosive esophagitis in pediatric patients. Dig Dis Sci 2006;51:858-63. 7. Tovar JA, Fragoso AC. Gastroesophageal reflux after repair of esophageal atresia. Eur J Pediatr Surg 2013;23:175-81. 8. Tieder JS, Altman RL, Bonkowsky JL, Brand DA, Claudius I, Cunningham DJ, et al. Management of apparent life-threatening events in infants: A systematic review. J Pediatr 2013;163:94-9.e1-6. 9. Macharia EW. Comparison of upper gastrointestinal contrast studies and pH/impedance tests for the diagnosis of childhood gastro-oesophageal reflux. Pediatr Radiol 2012;42:946-51. 10. Croffie JM, Fitzgerald JF, Molleston JP, Gupta SK, Corkins MR, Pfefferkorn MD, et al. Accuracy and tolerability of the Bravo catheter-free pH capsule in patients between the ages of 4 and 18 years. J Pediatr Gastroenterol Nutr 2007;45:559-63. 11. El Mouzan MI, Abdullah AM. Qualitative assessment of esophageal pH recording. J Trop Pediatr 2002;48:47-50. 12. Wenzl TG, Benninga MA, Loots CM, Salvatore S, Vandenplas Y. Indications, methodology, and interpretation of combined esophageal impedance-pH monitoring in children. J Pediatr Gastroenterol Nutr 2012;55:230-4. 13. El Mouzan MI, Abdullah AM. The diagnosis of gastroesophageal reflux disease. Saudi Med J 2002;23:164-7. 14. Thomson M, Antao B, Hall S, Afzal N, Hurlstone P, Swain CP, et al. Medium-term outcome of endoluminal gastroplication with the EndoCinch device in children. J Pediatr Gastroenterol Nutr 2008;46:172-7. 15. Iacono G, Carroccio A, Cavataio F, Montalto G, Kazmierska I, Lorello D, et al. Gastroesophageal reflux and cow's milk allergy in infants: A prospective study. J Allergy Clin Immunol 1996;97:822-7. 16. Hill DJ, Cameron DJ, Francis DE, Gonzalez-Andaya AM, Hosking CS. Challenge confirmation of late-onset reactions to extensively hydrolyzed formulas in infants with multiple food protein intolerance. J Allergy Clin Immunol 1995;96:386-94. 17. Isolauri E, Tahvanainen A, Peltola T, Arvola T. Breast-feeding of allergic infants. J Pediatr 1999;134:27-32. 18. Vance GH, Lewis SA, Grimshaw KE, Wood PJ, Briggs RA, Thornton CA, et al. Exposure of the fetus and infant to hens' egg ovalbumin via the placenta and breast milk in relation to maternal intake of dietary egg. Clin Exp Allergy 2005;35:1318-26. 19. Khoshoo V, Ross G, Brown S, Edell D. Smaller volume, thickened formulas in the management of gastroesophageal reflux in thriving infants. J Pediatr Gastroenterol Nutr 2000;31:554-6. 20. Orenstein SR, Shalaby TM, Putnam PE. Thickened feedings as a cause of increased coughing when used as therapy for gastroesophageal reflux in infants. J Pediatr 1992;121:913-5. 21. Chao HC, Vandenplas Y. Comparison of the effect of a cornstarch thickened formula and strengthened regular formula on regurgitation, gastric emptying and weight gain in infantile regurgitation. Dis Esophagus 2007;20:155-60. 22. Meyers WF, Herbst JJ. Effectiveness of positioning therapy for gastroesophageal reflux. Pediatrics 1982;69:768-72. 23. Vandenplas Y, Sacre-Smits L. Seventeen-hour continuous esophageal pH monitoring in the newborn: Evaluation of the influence of position in asymptomatic and symptomatic babies. J Pediatr Gastroenterol Nutr 1985;4:356-61. 24. Tobin JM, McCloud P, Cameron DJ. Posture and gastro-oesophageal reflux: A case for left lateral positioning. Arch Dis Child 1997;76:254-8. 25. Corvaglia L, Rotatori R, Ferlini M, Aceti A, Ancora G, Faldella G. The effect of body positioning on gastroesophageal reflux in premature infants: Evaluation by combined impedance and pH monitoring. J Pediatr 2007;151:591-6.596 e1. 26. Bhat RY, Rafferty GF, Hannam S, Greenough A. Acid gastroesophageal reflux in convalescent preterm infants: Effect of posture and relationship to apnea. Pediatr Res 2007;62:620-3. 27. Orenstein SR, Whitington PF, Orenstein DM. The infant seat as treatment for gastroesophageal reflux. N Engl J Med 1983;309:760-3. 28. Cucchiara S, Staiano A, Romaniello G, Capobianco S, Auricchio S. Antacids and cimetidine treatment for gastro-oesophageal reflux and peptic oesophagitis. Arch Dis Child 1984;59:842-7. 29. Tsou VM, Young RM, Hart MH, Vanderhoof JA. Elevated plasma aluminum levels in normal infants receiving antacids containing aluminum. Pediatrics 1991;87:148-51. 30. Sedman A. Aluminum toxicity in childhood. Pediatr Nephrol 1992;6:383-93. 31. American Academy of Pediatrics Committee on Nutrition. Aluminum toxicity in infants and children. Pediatrics 1996;97:413-6. 32. Friedman JA, Carroll JC, Bergstrom WH. Antacid-induced hypophosphatemic rickets. Drug Nutr Interact 1985;3:197-9. 33. Simon B, Ravelli GP, Goffin H. Sucralfate gel versus placebo in patients with non-erosive gastro-oesophageal reflux disease. Aliment Pharmacol Ther 1996;10:441-6. 34. Mallet E, Mouterde O, Dubois F, Flipo JL, Moore N. Use of ranitidine in young infants with gastro-oesophageal reflux. Eur J Clin Pharmacol 1989;36:641-2. 35. Hyman PE, Garvey TQ 3rd, Abrams CE. Tolerance to intravenous ranitidine. J Pediatr 1987;110:794-6. 36. Ward RM, Kearns GL. Proton pump inhibitors in pediatrics: Mechanism of action, pharmacokinetics, pharmacogenetics, and pharmacodynamics. Paediatr Drugs 2013;15:119-31. 37. Orenstein SR, Hassall E, Furmaga-Jablonska W, Atkinson S, Raanan M. Multicenter, double-blind, randomized, placebo-controlled trial assessing efficacy and safety of proton pump inhibitor lansoprazole in infants with symptoms of gastroesophageal reflux disease. J Pediatr 2009;154:514-20. 38. Davidson G, Wenzl TG, Thomson M, Omari T, Barker P, Lundborg P, et al. Efficacy and safety of once-daily esomeprazole for the treatment of gastroesophageal reflux disease in neonatal patients. J Pediatr 2013;163:692-698.e2. 39. Moore DJ, Tao BS, Lines DR, Hirte C, Heddle ML, Davidson GP. Double-blind placebocontrolled trial of omeprazole in irritable infants with gastroesophageal reflux. J Pediatr 2003;143:219-23. 40. Writing Committee for the American Lung Association Asthma Clinical Research Centers, Holbrook JT, Wise RA, Gold BD, Blake K, Brown ED, et al. Lansoprazole for children with poorly controlled asthma: A randomized controlled trial. JAMA 2012;307:373-81. 41. Li J, Zhao J, Hamer-Maansson JE, Andersson T, Fulmer R, Illueca M, et al. Pharmacokinetic properties of esomeprazole in adolescent patients aged 12 to 17 years with symptoms of gastroesophageal reflux disease: A randomized, open-label study. Clin Ther 2006;28:419-27. 42. Tolia V, Fitzgerald J, Hassall E, Huang B, Pilmer B, Kane R 3rd. Safety of lansoprazole in the treatment of gastroesophageal reflux disease in children. J Pediatr Gastroenterol Nutr 2002;35 (Suppl 4):S300-7. 43. Canani RB, Cirillo P, Roggero P, Romano C, Malamisura B, Terrin G, et al. Therapy with gastric acidity inhibitors increases the risk of acute gastroenteritis and community-acquired pneumonia in children. Pediatrics 2006;117:e817-20. 44. Guillet R, Stoll BJ, Cotten CM, Gantz M, McDonald S, Poole WK, et al. Association of H2-blocker therapy and higher incidence of necrotizing enterocolitis in very low birth weight infants. Pediatrics 2006;117:e137-42. 45. Saiman L, Ludington E, Dawson JD, Patterson JE, Rangel-Frausto S, Wiblin RT, et al. Risk factors for Candida species colonization of neonatal intensive care unit patients. Pediatr Infect Dis J 2001;20:1119-24. 46. Dial S, Delaney JA, Barkun AN, Suissa S. Use of gastric acid suppressive agents and the risk of community-acquired Clostridium difficile-associated disease. JAMA 2005;294:2989-95. 47. Laheij RJ, Sturkenboom MC, Hassing RJ, Dieleman J, Stricker BH, Jansen JB. Risk of community- acquired pneumonia and use of gastric acid-suppressive drugs. JAMA 2004;292:1955-60. 48. Valuck RJ, Ruscin JM. A case-control study on adverse effects: H2 blocker or proton pump inhibitor use and risk of vitamin B12 deficiency in older adults. J Clin Epidemiol 2004;57:422-8. 49. Yang YX, Lewis JD, Epstein S, Metz DC. Long-term proton pump inhibitor therapy and risk of hip fracture. JAMA 2006;296:2947-53. 50. Geevasinga N, Coleman PL, Webster AC, Roger SD. Proton pump inhibitors and acute interstitial nephritis. Clin Gastroenterol Hepatol 2006;4:597-604. 51. Brewster UC, Perazella MA. Proton pump inhibitors and the kidney: Critical review. Clin Nephrol 2007;68:65-72. 52. Perrio M, Voss S, Shakir SA. Application of the bradford hill criteria to assess the causality of cisapride-induced arrhythmia: A model for assessing causal association in pharmacovigilance. Drug Saf 2007;30:333-46. 53. Craig WR, Hanlon-Dearman A, Sinclair C, Taback S, Moffatt M. Metoclopramide, thickened feedings, and positioning for gastrooesophageal reflux in children under two years. Cochrane Database Syst Rev 2004:CD003502. 54. Machida HM, Forbes DA, Gall DG, Scott RB. Metoclopramide in gastroesophageal reflux of infancy. J Pediatr 1988;112:483-7. 55. Shafrir Y, Levy Y, Beharab A, Nitzam M, Steinherz R. Acute dystonic reaction to bethanechol-a direct acetylcholine receptor agonist. Dev Med Child Neurol 1986;28:646-8. 56. Madani S, Tolia V. Gynecomastia with metoclopramide use in pediatric patients. J Clin Gastroenterol 1997;24:79-81. 57. Putnam PE, Orenstein SR, Wessel HB, Stowe RM. Tardive dyskinesia associated with use of metoclopramide in a child. J Pediatr 1992;121:983-5. 58. Pritchard DS, Baber N, Stephenson T. Should domperidone be used for the treatment of gastro-oesophageal reflux in children? Systematic review of randomized controlled trials in children aged1 month to 11 years old. Br J Clin Pharmacol 2005;59:725-9. 59. Vela MF, Tutuian R, Katz PO, Castell DO. Baclofen decreases acid and non-acid post-prandial gastro-oesophageal reflux measured by combined multichannel intraluminal impedance and pH. Aliment Pharmacol Ther 2003;17:243-51. 60. Omari TI, Benninga MA, Sansom L, Butler RN, Dent J, Davidson GP. Effect of baclofen on esophagogastric motility and gastroesophageal reflux in children with gastroesophageal reflux disease: A randomized controlled trial. J Pediatr 2006;149:468-74. 61. Kawai M, Kawahara H, Hirayama S, Yoshimura N, Ida S. Effect of baclofen on emesis and 24-hour esophageal pH in neurologically impaired children with gastroesophageal reflux disease. J Pediatr Gastroenterol Nutr 2004;38:317-23. 62. Di Lorenzo C. Gastroesophageal reflux: Not a time to ''relax''. J Pediatr 2006;149:436-8. 63. Vadlamudi NB, Hitch MC, Dimmitt RA, Thame KA. Baclofen for the treatment of pediatric gastroesophageal reflux disease: A single tertiary center experience. J Pediatr Gastroenterol Nutr 2013 Dec; 57(6):808-12. doi: 10.1097/MPG.0b013e3182a274b. 64. Berquist WE, Fonkalsrud EW, Ament ME. Effectiveness of Nissen fundoplication for gastroesophageal reflux in children as measured by 24-hour intraesophageal pH monitoring. J Pediatr Surg 1981;16:872-5. 65. Pearl RH, Robie DK, Ein SH, Shandling B, Wesson DE, Superina R, et al. Complications of gastroesophageal antireflux surgery in neurologically impaired versus neurologically normal children. J Pediatr Surg 1990;25:1169-73. 66. Martinez DA, Ginn-Pease ME, Caniano DA. Sequelae of antireflux surgery in profoundly disabled children. J Pediatr Surg1992;27:267-73. 67. Curci MR, Dibbins AW. Problems associated with a Nissen fundoplication following tracheoesophageal fistula and esophageal atresia repair. Arch Surg 1988;123:618-20. 68. Wheatley MJ, Coran AG, Wesley JR. Efficacy of the Nissen fundoplication in the management of gastroesophageal reflux following esophageal atresia repair. J Pediatr Surg 1993;28:53-5. 69. Kubiak R, Spitz L, Kiely EM, Drake D, Pierro A. Effectiveness of fundoplication in early infancy. J Pediatr Surg 1999;34:295-9. 70. Harnsberger JK, Corey JJ, Johnson DG, Herbst JJ. Long-term followup of surgery for gastroesophageal reflux in infants and children. J Pediatr 1983;102:505-8. 71. van der Zee DC, Arends NJ, Bax NM. The value of 24-h pH study in evaluating the results of laparoscopic antireflux surgery in children. Surg Endosc 1999;13:918-21. 72. Lasser MS, Liao JG, Burd RS. National trends in the use of antireflux procedures for children. Pediatrics 2006;118:1828-35.